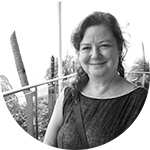 As a professional musician, educator, and administrator, Rachel Bernstein has worked in the arts for over thirty years. 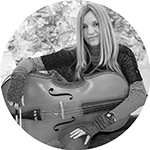 Bernstein came to Heights Arts in 2013 after fifteen years in various administrative positions at The Music Settlement in University Circle, where she continues to teach as an instructor in the Suzuki cello method. Since joining Heights Arts, Rachel has concentrated her passion for the arts on creative internal collaborations to connect Heights Arts’ many programs in unique ways; and partnering with the many regional arts organizations, businesses, and people who share her belief in the power of the arts. 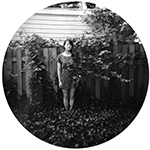 Courtney Young is a graduate of the Tyler School of Art in Philadelphia, where she studied art history, photography, and fibers arts. 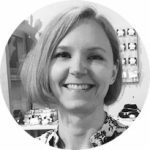 She lends her arts and administration expertise to managing the gallery store, facilitating our 11 annual exhibitions, and keeping our data systems and budget reporting on track. She is continually inspired by the range, depth, and creativity of work produced by the Northeast Ohio artists represented at Heights Arts. In eighth grade, Genevieve Schwartz decided that when she grew up, she would move to Cleveland Heights. After graduating from Kent State University with a degree in Metals and Jewelry, she set out to realize her dream of being part of the community that remains a daily inspiration. Violinist Ariel Clayton Karas gives more than 150 performances annually throughout northeast Ohio as director of OPUS 216 and Classical Revolution Cleveland, and as an independent solo artist. As director of Classical Revolution Cleveland, Ms. Clayton Karas coordinates the 45+ annual performances by CRC members in non-traditional venues, and the ensemble is frequently featured on local radio broadcasts and independent podcasts. Since 2016, Classical Revolution Cleveland has worked closely with Heights Arts to facilitate their music programming. 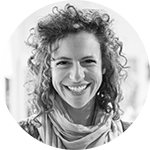 Ann Koslow is a freelance program and event manager for nonprofit organization and private social events. With a background in Art History and Urban Planning, her passion is to bring art to the community. She has held arts administration and event management positions in northeast Ohio and southern Florida. Upon returning to Cleveland in 2017, Ann began her relationship with Heights Arts as a volunteer for Close Encounters concert series and the Enticing event, she now manages these events. Learn more about our plans for the future, and the role of our Board here. Heights Arts is governed by a community-based Board of Trustees who may serve two consecutive 3-year terms. Interested in being part of our Board? At this moment in our history, Heights Arts is looking to expand and deepen the board in specific areas, which are a result of the goals and values spelled out in our 2018 strategic plan. We are keenly interested in expanding the geographic diversity of our board to include members from the ‘Greater Heights’ suburbs (and beyond) to better reflect our broad service area. We are highly interested in reflecting the ethnic diversity of our community to a greater degree. We welcome applications from early and mid-career professionals. Our board would benefit greatly from membership by people with legal, financial, and human resources skills, as well as those with retail and business technology expertise.